4 1TB PRO CONSOLA NEGRA CON HDR 4K. (1 x Netzkabel 220V 8Stromanschluss). 1x Playstation 4 Pro - Konsole 1TB schwarz (Modellbezeichnung: CUH 7016B). 1 x HDMI Kabel (Monitor-/Fernseheranschluss). Profitieren Sie von der Erfahrung und Qualität eines Fachhändlers, wir kennen uns aus. Supporta la risoluzione 4K (3840×2160 pixel, ossia 8.294.400 pixel su schermo). In FIFA Ultimate Team™, le ICONE di FUT, tra cui Ronaldo Nazário e altre leggende del calcio, si apprestano a sbarcare in FIFA 18. Playstation 4 Pro PS4 NEW OLD SOFTWARE CONSOLE CUH-7016B 4.07 1TB HD 4K!! 5. Sony PlayStation 4 Pro. Standard Wi-Fi: IEEE 802.11a, IEEE 802.11ac, IEEE 802.11b, IEEE 802.11g, IEEE 802.11n, Versione Bluetooth: 4.0 LE. Frequenza di ingresso AC: 50/60 Hz. Colore del prodotto: Nero. BUNDLE DOPPIO DUALSHOCK INCLUSO !! CONSOLE SONY PLAYSTATION 4 PRO NUOVA VERSIONE GAMMA. REA 108 205. CARATTERISTICHE;. 4,5 su 5 stelle - SONY PlayStation 4 ,PS4, PRO GAMMA da 1TB Nera . 4 valutazioni prodotto4 valutazioni prodotto - SONY PlayStation 4 ,PS4, PRO GAMMA da 1TB Nera . 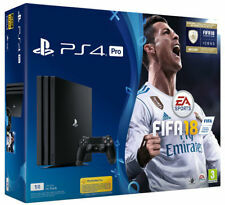 Sony Playstation 4 PRO FIFA19 BUNDLE. - Spiel FIFA19 Champions Edition. Die Geräte haben ein paar wenige Feinkratzer in der Front auf der Konsole, welche man kaum erkennt. - Sony Playstation 4 Pro Konsole, 1TB, schwarz. Playstation 4 Pro 1TB White. Picture for illustration purpose. 4K Graphics. Sony Playstation 4 Pro. Hook up with the biggest online community of players with playstation plus. Fast, personal and easier to share, connect and play with friends. Built-in Blu-ray disc drive. Playstation 4 Pro 1TB White. Sony® PlayStation® Pro 1TB Console White. Playstation 4 Pro Console 1TB. This Fantastic PlayStation 4 Console is in Brilliant Condition & Has Had Very Little Previous Use. The Console & Included Accessories Have Been Fully Tested/PAT Tested - The Console Has Also Been Factory Reset. For sale is a PS4 Pro 1TB console. Included in the bundle is: - Console - Power lead - HDMI - Controller - Controller cable - 2 games - Box (heavily damaged with a big rip down the front) Everything is in great condition including the box. The console itself is in absolutely mint condition with no marks or scuffs. Thanks for looking and feel free to message with any questions. Have a great day. Sony® PlayStation® Pro 1TB Console Black. PlayStation 4 Pro 1TB Konsole Kingdom Hearts III. Durch die Macht der Freundschaft verbünden Sora, Donald und Goofy sich mit alten und neuen Disney-Pixar-Kultcharakteren, um gewaltige Herausforderungen zu überwinden und gegen die Dunkelheit zu bestehen, die ihre Welten bedroht. Pre-owned Sony PlayStation 4 PRO 1TB 4K console di gioco-bianco. PlayStation 4 Pro - Konsole (1TB) Limited Edition. Sony PlayStation 4 Pro Limited Spiderman Edition 1TB rot (CUH-7016B). An der Konsole sind nur sehr geringe Kratzspuren zu sehen. Die angegebenen Preise sind Endpreise. Es ist kein weiteres Zubehör vorhanden! Rechnung mit 12 Monate Gewähr. 5 Spiele (sieh Bild). Optisch in einem sehr guten Zustand. Be greater and explore a new chapter in Marvel’s Spider-Man universe in stunning 4K and HDR quality graphics with Marvel’s Spider-Man PlayStation®4 Pro bundle. PlayStation 4 Pro 1TB Glacier White. Incluye FIFA 19 (Formato Físico). Capacidad: 1Tb. Playstation 4 PRO de1Tb Negra. Conéctate con tus amigos entre consolas PlayStation 4 Pro y PlayStation®4 y engánchate a la mayor comunidad de jugadores online con PlayStation Plus4. Playstation 4 Pro 1TB Red Dead Redemption 2 Bundle. Playstation VR Headset V2. Sony PlayStation 4 Pro jet black. Condition on everything is used but works perfectly as designed with no faults. Included is: - Ps4 pro - Dualshock 4 controller - The Witcher 3 wild Hunt - Battlefield 1 - Call of Duty infinite warfare - Minecraft - Hdmi cable - Power cable - Ethernet cable Any questions feel free to ask.